The Student could be thought of as a budget-minded version of the company’s Dia 2, although that more expensive pen has a few different features on cap and tail; both are large pens with an extremely traditional silhouette. The presence of the company logo as a jewel on the cap gives it, in my highly subjective appreciation, little boost of retro-styling. The barrel is actually a relatively modern shape, swelling below the joint before tapering down to allow cap-posting, but this is so subtle it is hard to notice unless someone like me points it out. The least traditional elements of the pen appear when the cap is off. The point, the same sort as found in the Sport, is a little small to be proportional to the rest of the pen. It’s not grotesque, but it is noticeable even with the distraction of that very shiny section. I don’t honestly understand why the section is chrome-plated, other than perhaps as a mark of the relatively low-cost nature of the pen; if you choose to spent less, your thriftiness will be marked with a somewhat garish section. The performance of the pen is bound up with both these elements. The section may be slippery to some, thanks to that plating. I have not found it a problem, but I also find that when I write with this pen I hold it well up so that I get some finger onto the cap threads. Those who prefer to hold a pen very close to the point may find this a problem. As small as the point is, though, it delivers nice writing performance, even to the extent of exhibiting a little bit of spring. My example also has a remarkably willing feed; there was hardly any delay between fitting a cartridge to the dry pen and being able to write with it. Production Run: 2010 (?) to present. I can’t find any reference to the model earlier than 2010, but if someone has a firmer start date I welcome correction. 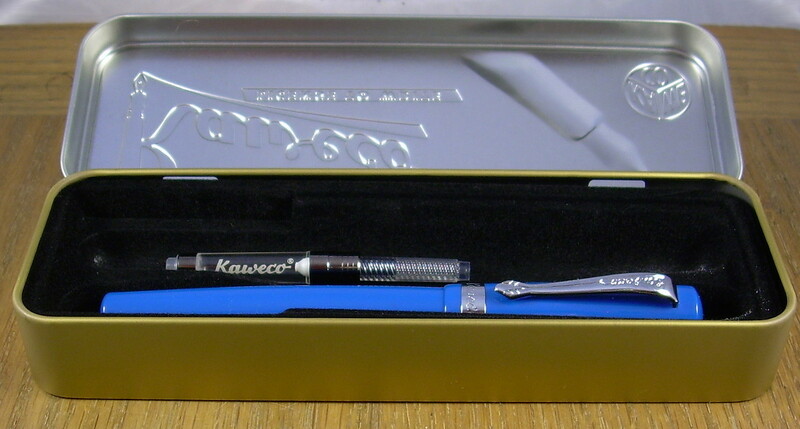 Cost When New: About $65 (Kaweco is not forthcoming with the MSRP). Size: 13.1 cm long capped, 16.0 cm posted, 12.0 cm uncapped. Filler: Cartridge, capacity approx. 0.6 ml or 1.4 ml (international pattern). A converter is also supplied. The Student in its native tin. There was also a cartridge in there, but by the time I took this the pen had gobbled it up as its first meal. I include this picture of the tin itself for no other reason than I am a sucker for retro packaging.